I'm back from my blog vacation. My husband is making a remarkable recovery, in our opinion, from a hip replacement on March 11. Book Arts Tuesday will resume tomorrow. In the meantime, I thought I'd share a few photos of our Easter table. Walking in Maudslay State Park on the first day of spring, I found this birch branch and some pieces of bark on the ground. I brought it home with thoughts of our Easter table. Birch is a symbol of beginnings and spring and it seemed perfect for an early Easter. I dug up two little clumps of scilla from the garden and placed them in glass cups and added candles and eggs. I was pleased with the simplicity. 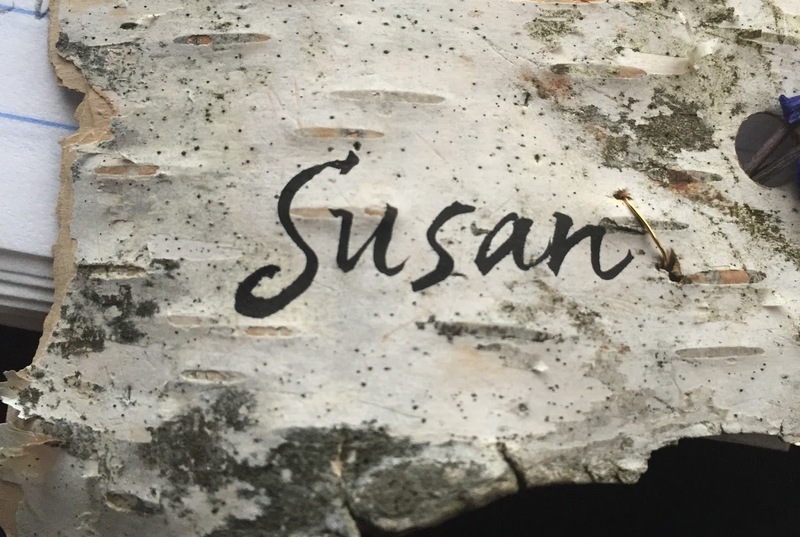 I made place cards of scilla and birch bark. I wrapped the scilla stems in a little bit of wet cotton and then wrapped them with floral tape. I punched a hole in the birch bark and threaded the wrapped stems through. A bit of wire held them in place. I think the wet cotton delayed the fading of the flowers by a bit, but they were starting to fade by the end of the meal. The last step was lettering on the names with a Pentel brush pen. 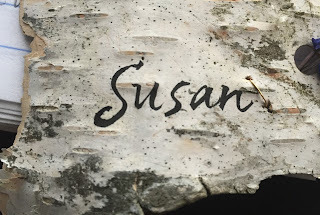 The bark surface was smooth and easy to write on. I think there may be more birch bark and letters in my future.